This is Downey Avenue looking north from Firestone Blvd. On the right is One Day Cleaners, Al's Beauty Supply store, Dream Home Realty, and E&E Shoes, the Foot Comfort Center. On the left is the parking structure for Porto's Bakery. This is the same shot but in 1945. According to the Downey Historical Society, "On the left is Home Boys market next to Downey Hardware. Across the street is Steck's hardware, furniture, and paint; Kruegers Shoe store; and Rexall Drugs. Steck's was next to the Victory Theatre, which eventually became the Avenue Theatre." 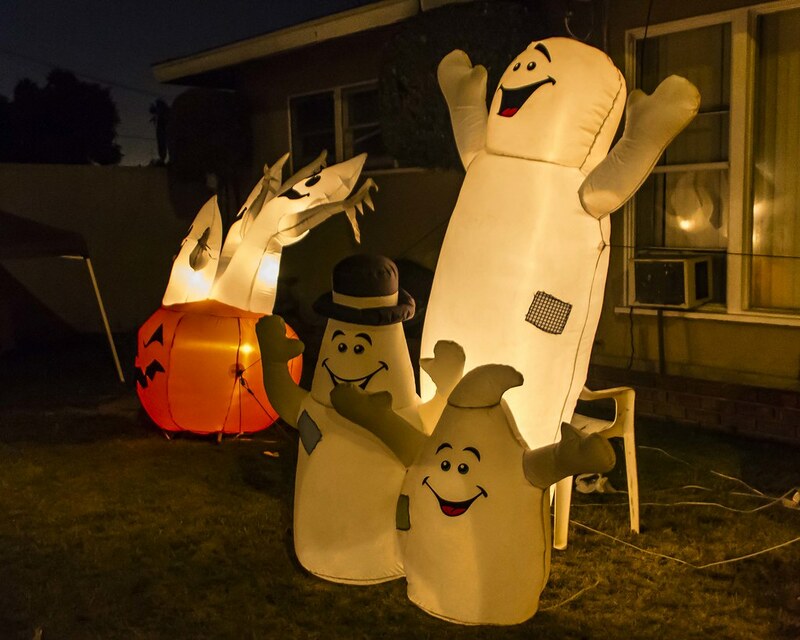 I went out looking for Halloween decorations this week just like Pam did and spotted this yard. I found out that the owner made all the decorations himself with some help from a neighbor. They had a combination birthday/Halloween party last week. These decorations were so good that I had to watch Pirates of the Caribbean this week. 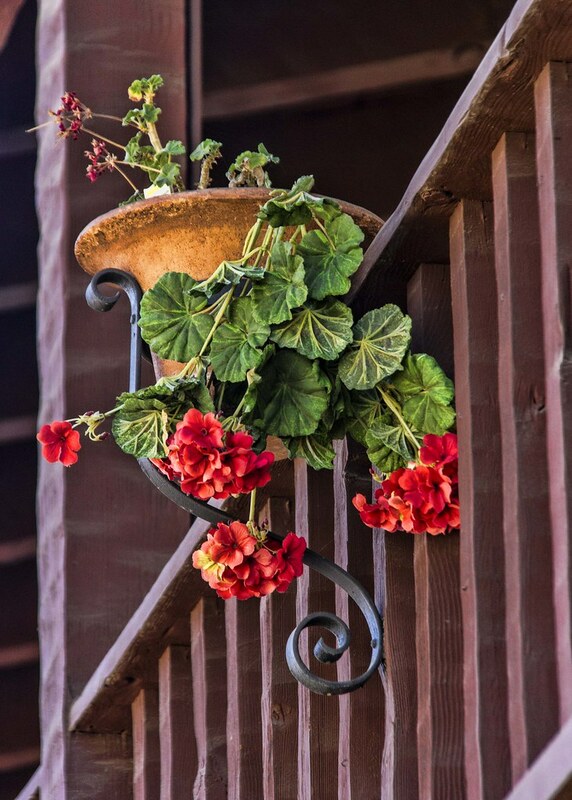 One of the things I love about living in southern California is how easily flowers grow in our temperate weather. 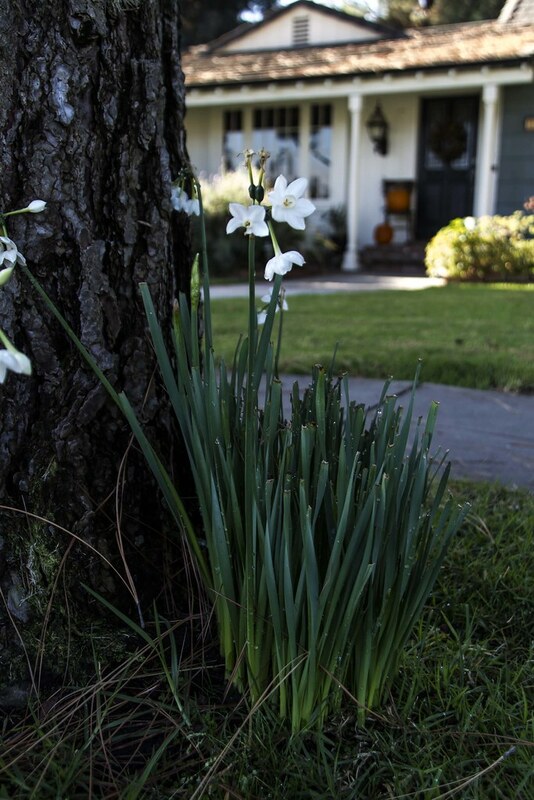 These Paperwhites grow from bulbs, and I would expect to see them bloom in the spring, yet they are already in bloom in Downey and it is still October. 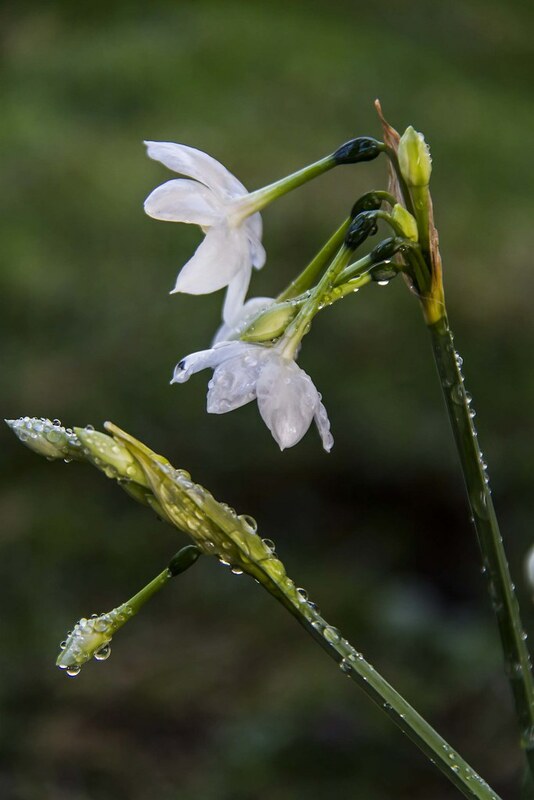 What a fun surprise to find them covered in dew this morning. Tonight I went looking for Halloween decorations. My two local favorites (here and here) aren't decorated this year, so I got in the car and drove around Downey. And drove...and drove. Apparently, people aren't decorating this year, at least not in the old-fashioned way. 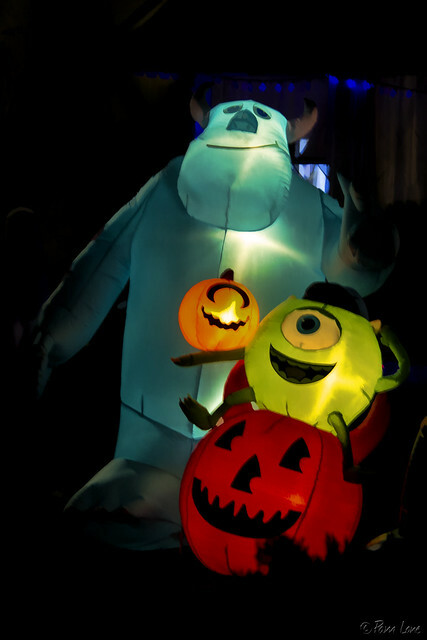 There were quite a few of the cartoon-like inflatable decorations, such as Mike and Sully, at right. But none of the truly ghoulish decor that is so fun to photograph. And then, at last, I saw a house in the distance, all lit up with decorations! I pulled up—and saw this house above, all ready for Christmas! And it's not even Halloween yet! 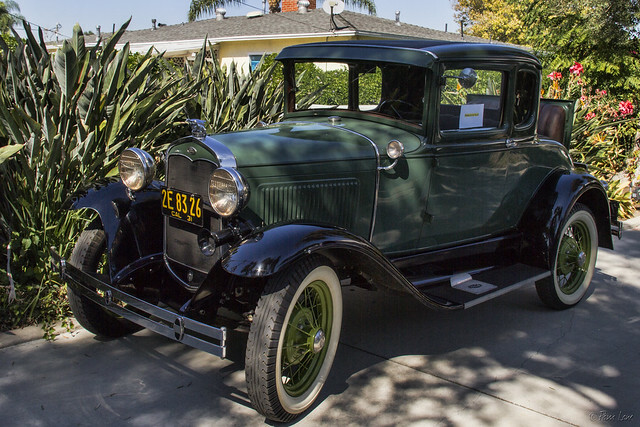 Speaking of classic cars (see yesterday's "In the pink"), this Ford Model A coupe was on display at the Casa de Parley Johnson open house. Based on the license plate, I'm assuming that this is a 1931 Model A. The Model A was manufactured from 1928 to 1931 and ranged in price from $385 for a roadster to $1,400 for the top-of-the-line Town Car. I came across this beautiful pink car on my morning walk. After looking at some of the pictures on line, it looks like a '58 Cadillac. I don't really know what it is, but I love that everything about it is pink. The phrase "in the pink" has been used over time to indicate being in the best of health, in the best condition. Sometimes it refers to the best quality. 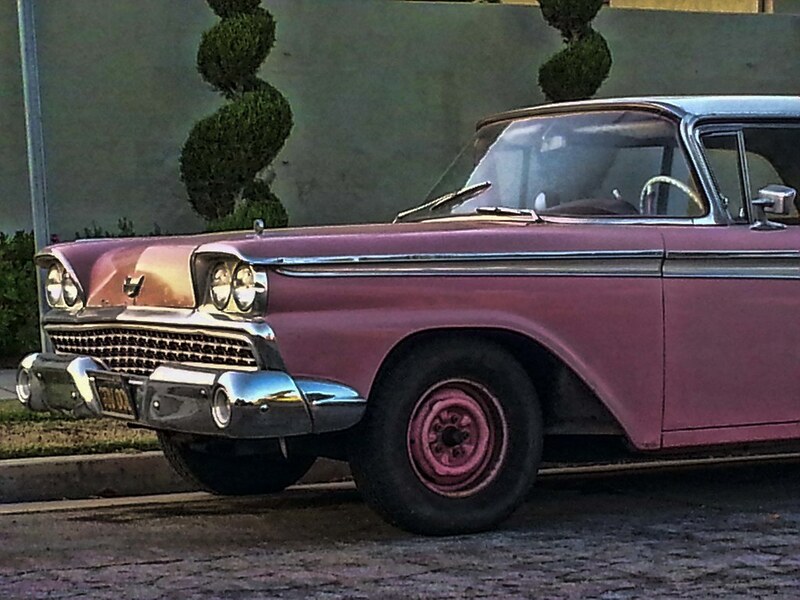 If this car is really 55 years old, I would certainly be willing to admit it's looking good enough to be considered "in the pink." The days are cooler now, but we keep experiencing the occasional 80-degree day. A day like that practically begs for bare feet. This guy was sunning his feet while enjoying the coolness of his car. Just 5 miles southeast of Downey is Cerritos College, where my wife and I took in a play this evening. We saw Shakespeare's "Midsummer Night's Dream" at the Burnright Center done in a 1950s decor. We thoroughly enjoyed ourselves. Ticket sales were brisk. When they opened the doors at 7:30pm, there were no more than 20 people waiting. By 8:00pm, the house was full. I spotted this van a couple of times around Downey and it is so unique that I had to take its picture. When my son was younger, he loved anything dinosaur and that is another reason I took this picture. I wanted to know if he wanted me to find out how to get this picture on his car. 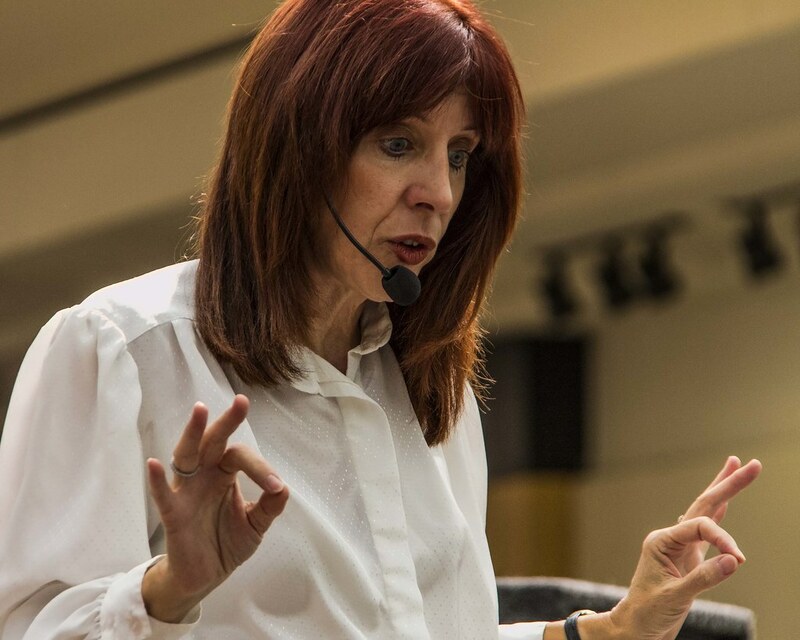 "Dinosaurs may be extinct from the face of the planet, but they are alive and well in our imaginations." The days seem shorter now and it has started getting colder. It's the transition from summer into winter. Autumn....fall...whatever you call it. That means it's time to wear sweaters, to look for the trees to change colors and the leaves to fall to the ground. 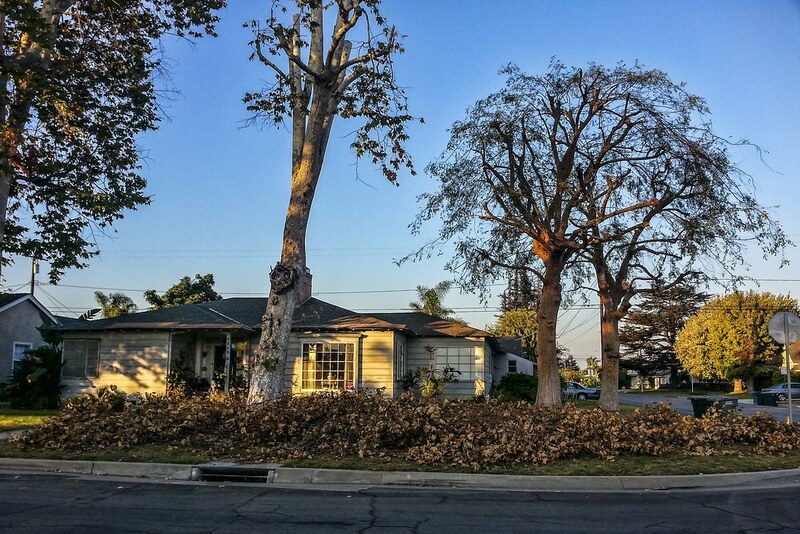 I'm guessing the leaves on this yard had some help. "Days decrease, and autumn grows, autumn in everything." 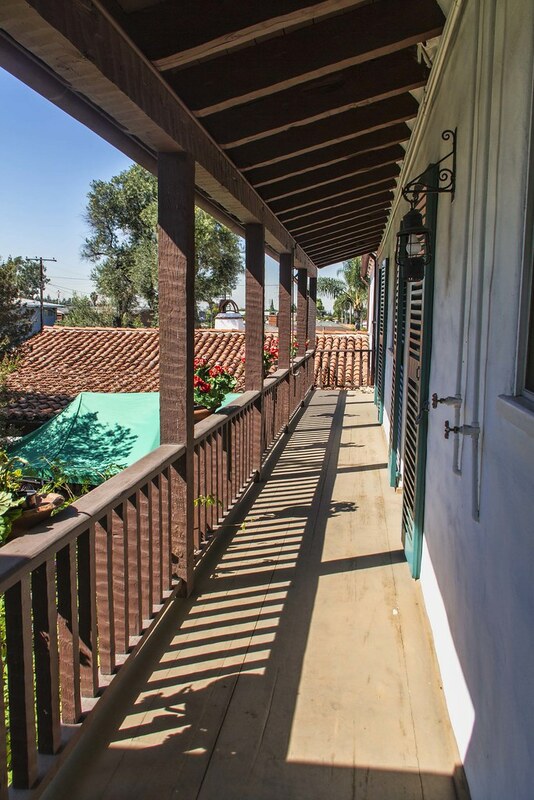 As Joan posted after Saturday's open house, the historic Casa de Parley Johnson is a beautiful old house with large sunlit rooms and surrounding balconies. 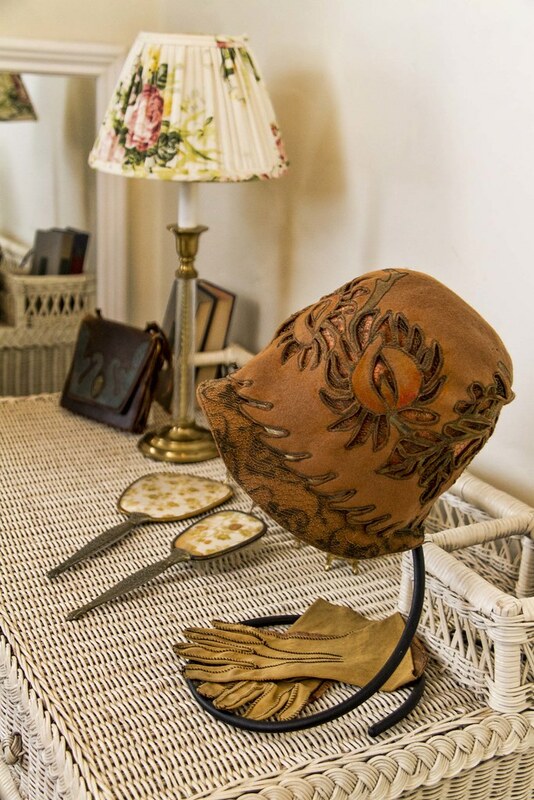 But the room that drew the most sighs, at least from the women, was the butler's pantry. Imagine having all this storage space for all your fine dinnerware. (Imagine having that much dinnerware!) And all that counter space for setting out the food to be served, and that huge double-sink. Notice the extremely wide drawers on the bottom right—you can store your tablecloths in these drawers with a minimum of folds and wrinkles. Even without the butler, the thought of it made us all a little envious! I know, you can buy your pumpkins at the local grocery store. But today's pumpkin patches let you make a family outing of the event. 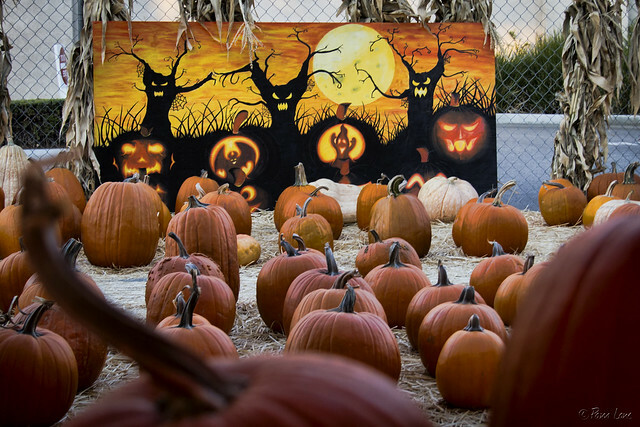 This pumpkin patch at CVS Pharmacy has it all—all the pumpkin variety you could wish for (see How do you like your pumpkins? 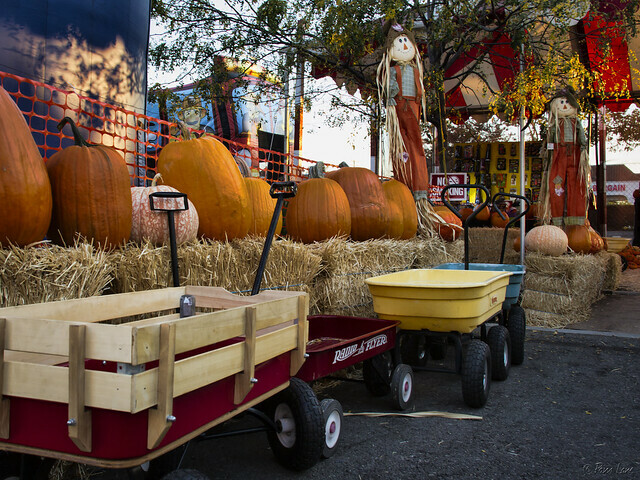 ), photo ops so that mom and dad can take pictures of the kids surrounded by pumpkins, pumpkin carving kits, wagons to load up the pumpkins on, and a moon bounce to entertain the kids if they get bored. Today was an open house fund-raiser for the Assistance League of Downey. 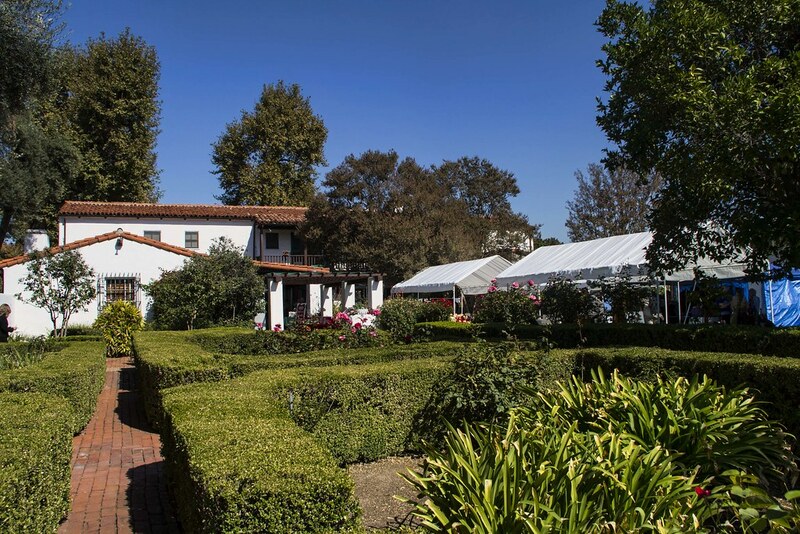 The event offered participants the chance to tour the 6,000 square foot Spanish Colonial Revival house designed by Roland Coate. It was an impressive visit. The style is very appealing with the archways and large rooms. I love the balconies that virtually surround the house. 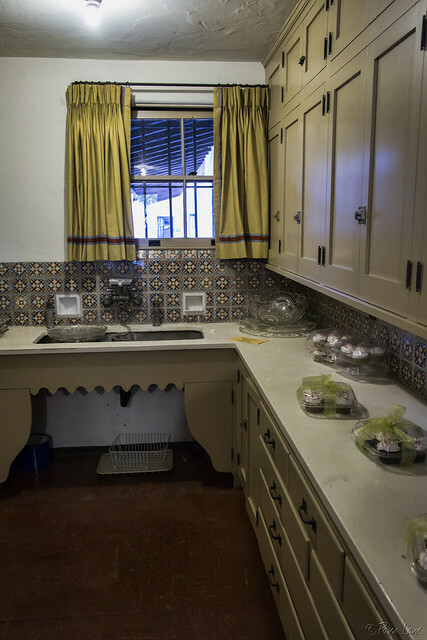 The house was designed for prominent citrus rancher Parley Johnson and his wife Gypsy. After her death in 1986, the house was bequeathed to the Assistance League of Downey. 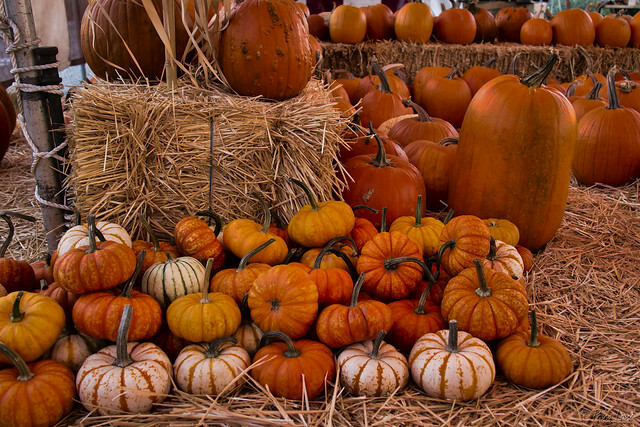 One of my favorite parts of fall is the pumpkins. I don't remember, back when I was a kid, the amazing variety of pumpkins that are available now. 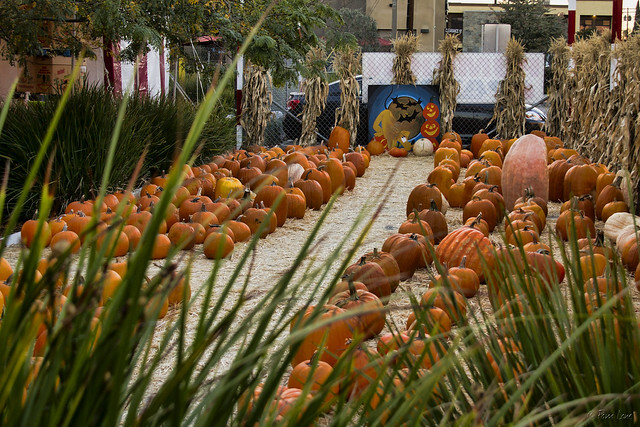 Do you like your pumpkins big or small? Short and squat, or tall and bold? Do you prefer traditional orange, or white, green, or some combination? 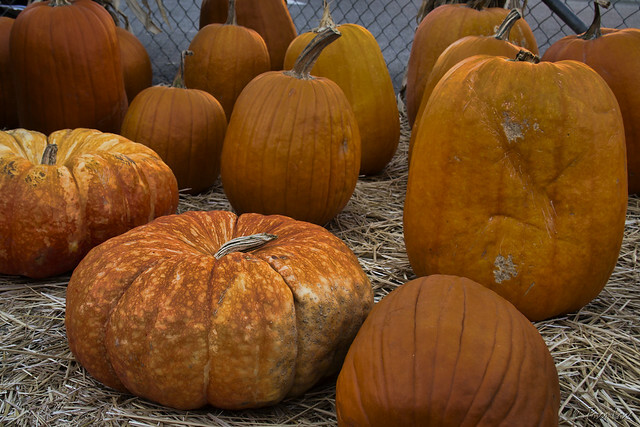 Do you want your pumpkin to have a perfect complexion or to be covered with warts? At the pumpkin patch in the CVS parking lot, you can find exactly what you want. Just down the street form yesterday's post is a sign for a new restaurant going in in downtown Downey. Joseph's Bar and Grill will be opening soon, it says, but in the meantime they are accepting applications. I really took the picture because of the shadows on the canvas and wall. They are so detailed that it looks like they are painted on the surfaces. 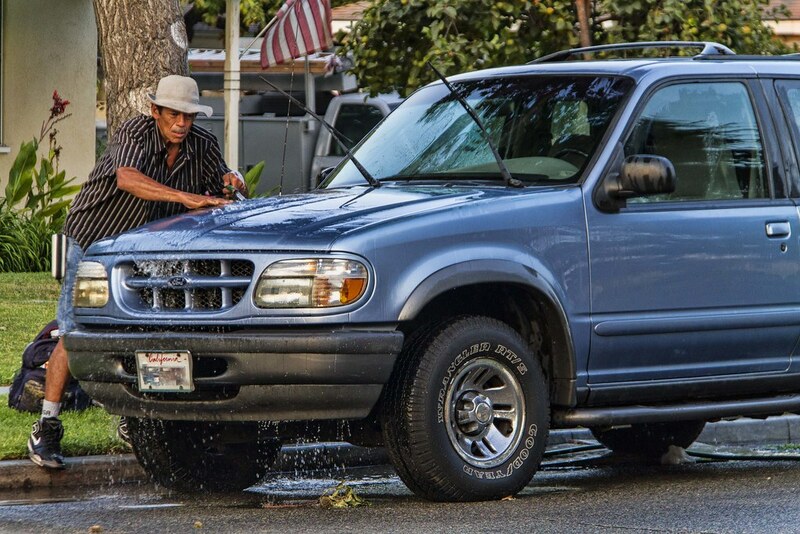 I came across this guy washing a car in our neighborhood.. I've seen mobile car wash and detailing businesses before, but never mobile via a bike. Very enterprising! I applaud his creativity. 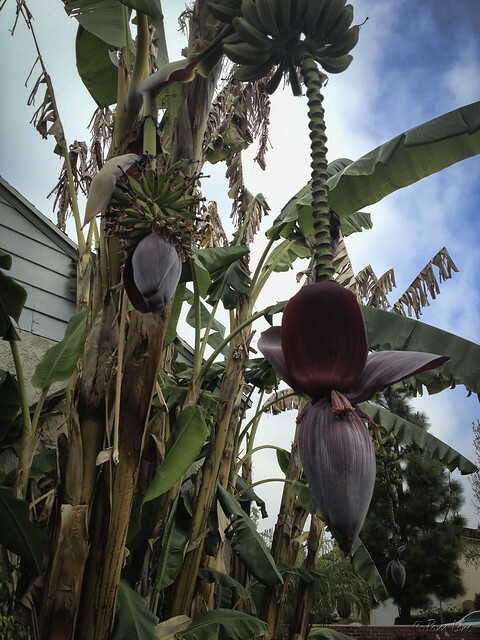 The banana palm, native to southeast Asia, is often used around Downey to give a tropical feeling to the landscaping. From the time the fruit first appears, it takes 3-4 months for the fruit to ripen. Did you know that bananas are naturally slightly radioactive because of their potassium content? 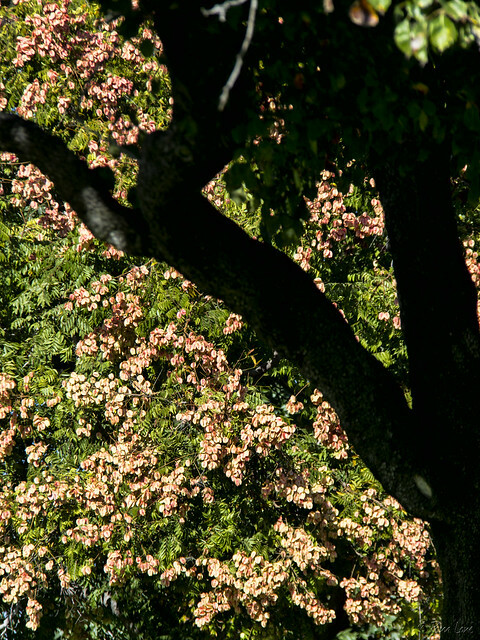 One final shot from Wilderness Park—these trees were in full fall bloom, with with orange "flowers" (I'm not sure you really call these flowers). These leaves don't appear to turn color or fall off, but the combined green of the leaves and orange of these flower pods were striking in their own way. 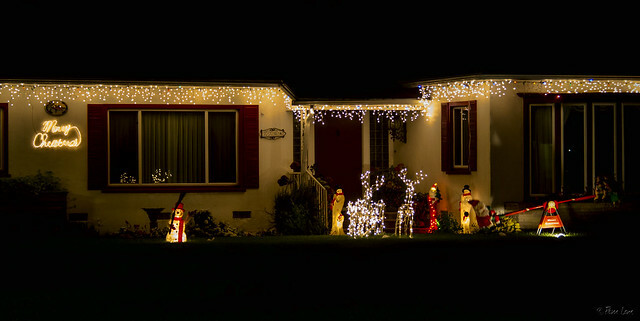 It used to be that it was only Christmas decorations that brightened our front yards at night. Now, it seems like I've been seeing more and more yards decorated in Halloween themes. Somehow, these characters seemed un-Halloween-like to me because they were so happy and smiley. 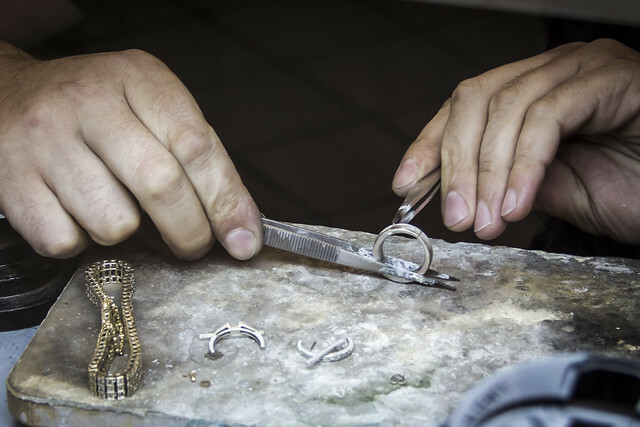 At a small side window at one of the Stonewood Center jewelry shops, you can watch the skilled hands of the jeweler work with gold and silver. This picture is taken looking east on Downey Ave. just south of Lexington, just like the picture below. That picture shows "Doc" McCormic as the driver for Sid Moore's milk delivery service in 1909. The first in Downey. The open field and single building have been replaced with multiple buildings, palm trees, and telephone poles. 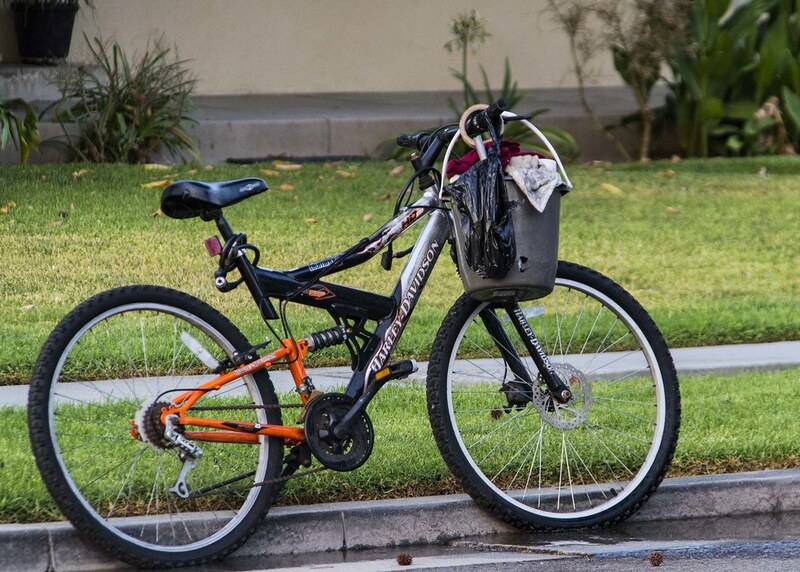 The single horsepower vehicle has been replaced with a slightly more powerful version to deliver the milk to residences here in Downey. Rockview Dairy, another dairy delivery company, has been delivering dairy products to Downey since 1927. You can read their history here. You can start up home delivery here. Several things that haven't changed are that the milk still comes from contented California cows and the cows run the shop. There are a couple of the leaders up on the roof. This is Neil's Stationers at La Reina and Firestone Blvd here in Downey. They have been there since 1955 serving Downey's office supply needs. 136 years ago the Central Hotel was on this corner serving visitors' needs for hospitality as they came to the bustling commercial center growing up in Downey. John Gately Downey and Maston Duke Crawford built the hotel in 1877, which lasted until it burned down in 1900. 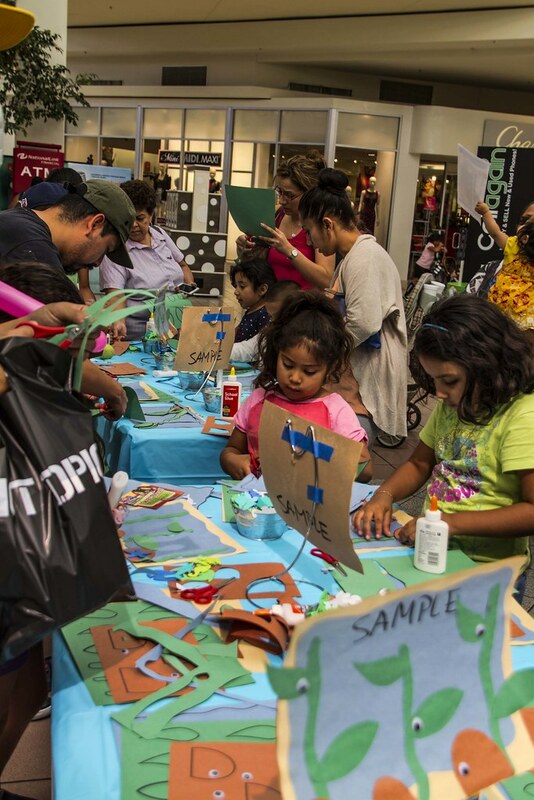 Saturday was Kid's Club at the Stonewood Center Mall (sponsored by National Geographic Kids). Kids gathered around the stage while Wacky Wendy talked about sea creatures. Here you see some of the participants being kelp. 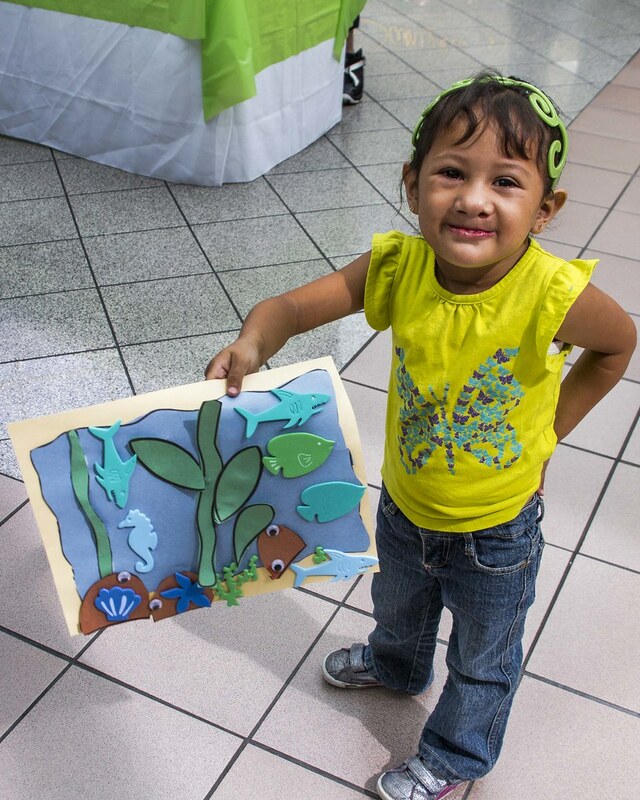 After a fun teaching time, complete with live music, the kids were invited to use the provided materials to create their own "under the sea" art project. This little artist was proud to share her work! It's not just the young boys that enjoy the Indian summer. 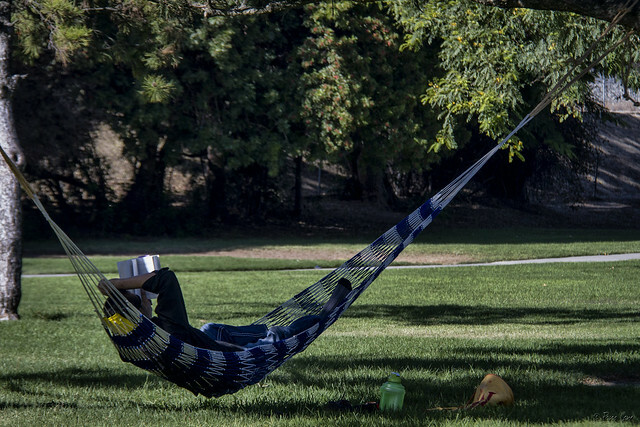 This man found the perfect hammock-hanging pair of trees and was enjoying some peace and quiet with a good book. 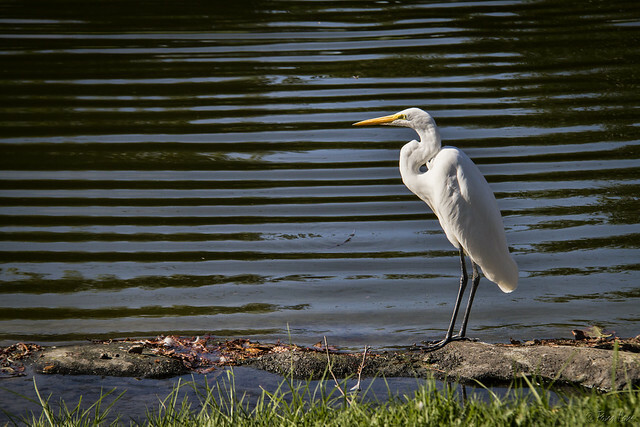 And this great egret, below, kept watch on us all. An Indian summer is a period of unseasonably warm, dry weather, occurring after the end of summer proper. This particular Indian summer struck on a weekend, and people took to the parks to enjoy the 90-degree temperatures. 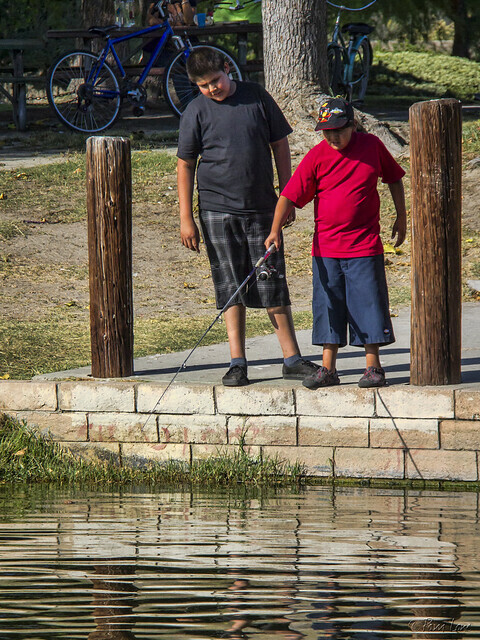 At Wilderness Park, one of the favorite activities was fishing. 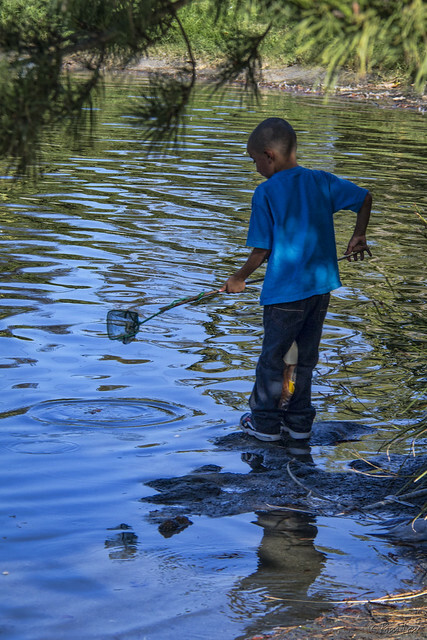 Whether you use a pole with a reel and hook, or just try to scoop the fish up with a net, the allure is the same for young boys everywhere. 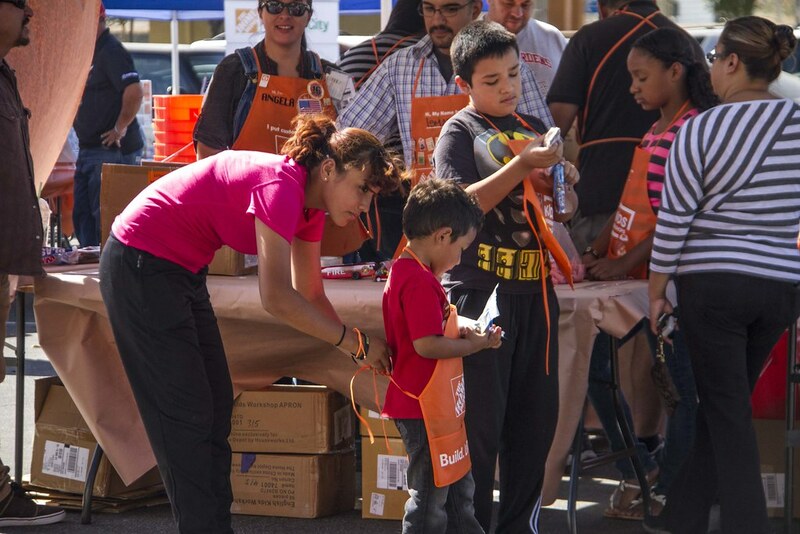 The first Saturday of every month, Home Depot sponsors a Kid's day (click here to view Home Depot's web site). 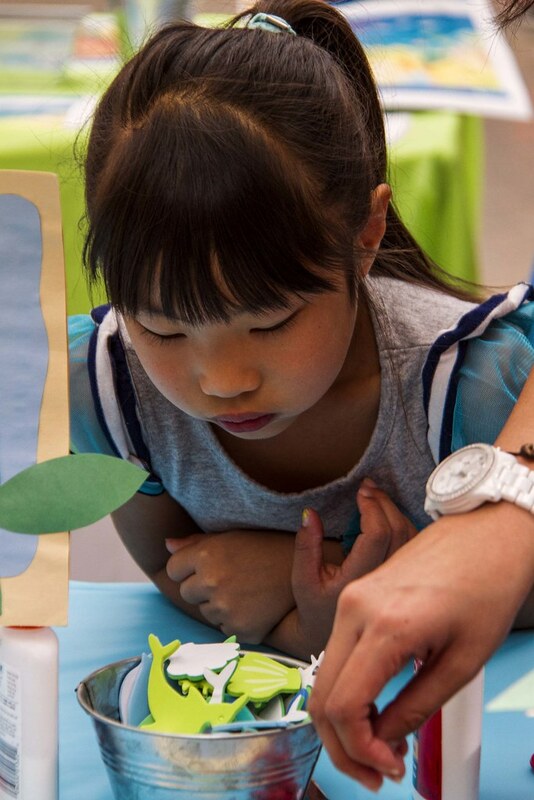 Kids get kid-sized aprons and all they need to work on a project. 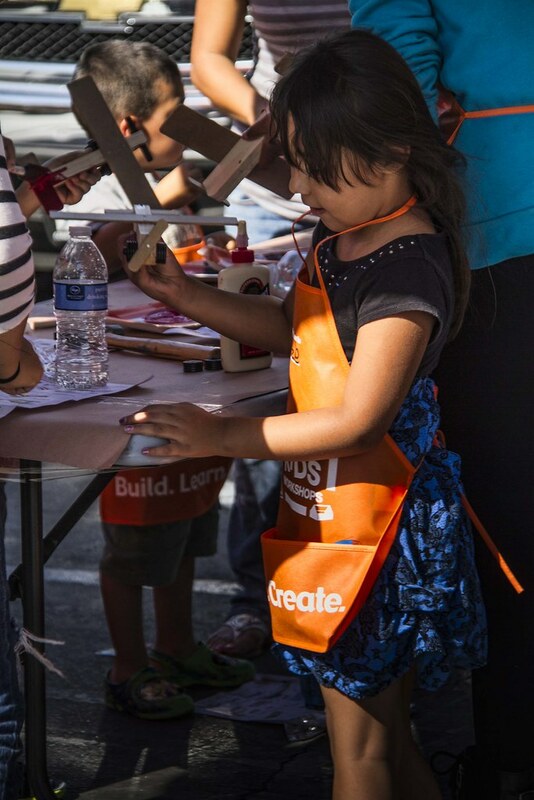 It was fun to watch both parents and kids participate in creating the most interesting wooden airplanes. 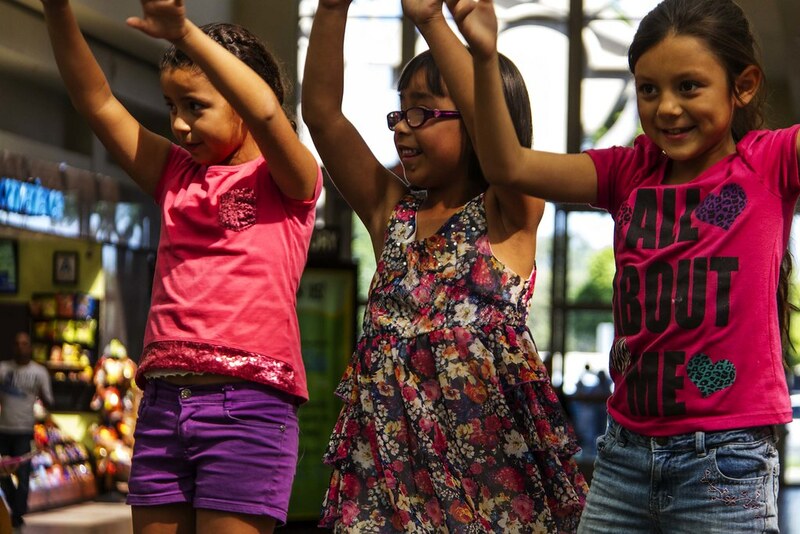 What a fun lesson for the kids and a great memory of personal accomplishment. They learn to use tools and follow instructions, and they get to take home whatever they make. 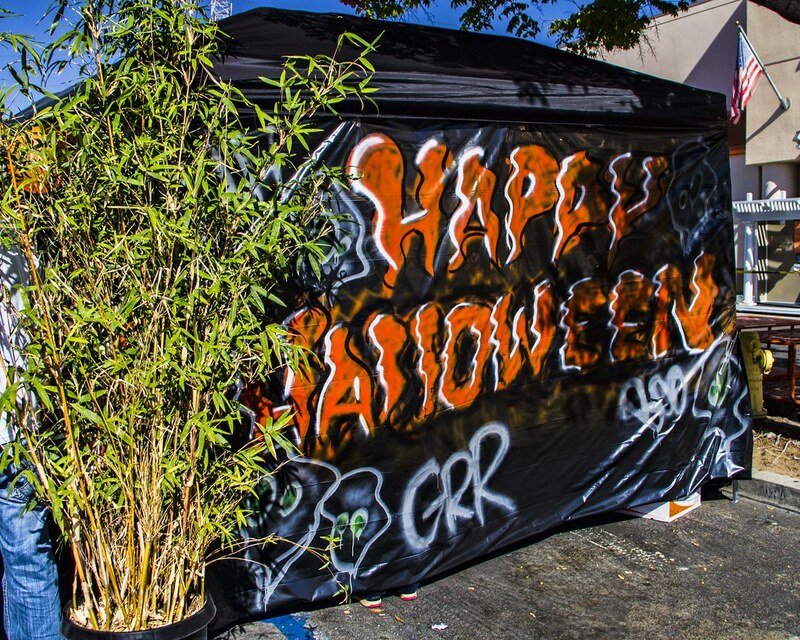 Today's event also had a Halloween focus: there were pumpkins and a scary photo booth available.